The Korean peninsula is at a "turning point" and there are opportunities for change, South Korean President Lee Myung-bak said in a new year speech. He said Seoul would "respond strongly" if provoked by North Korea, with whom it remains technically at war. But he said that the biggest goal was stability, and that aid-for-disarmament talks could resume if Pyongyang halted its nuclear activities. On Sunday North Korea told citizens to defend leader Kim Jong-un to the death. Kim Jong-un has succeeded his father, Kim Jong-il, who died on 17 December at the age of 69. On Friday, the country's powerful National Defence Commission warned the outside world to expect no change from the new leadership. In a nationally televised address, Lee Myung-bak said that peace was his priority and that a "window of opportunity" had opened for better ties with the North. "The situation on the Korean peninsula is now entering a new turning point," he said. "But there should be a new opportunity amid changes and uncertainty." South Korea would, however, "thoroughly maintain national security as long as there is a possibility of provocation by the North", he added. Kim Jong-il had ruled North Korea since the death of his father, Kim Il-sung, in 1994. The impoverished and isolated communist country faces ongoing food shortages. Funds are channelled to the military and North Korea has conducted two nuclear tests since 2006. In the last two years, ties between the two Koreas have been extremely tense. Mr Lee's decision to link the provision of aid to North Korea to progress on nuclear disarmament has angered the North. South Korea also blames its northern neighbour for sinking its warship in March 2010, killing 46 sailors. Eight months later, North Korea shelled a Southern border island, killing four people. Pyongyang denies any role in the first incident and says South Korea provoked the second. 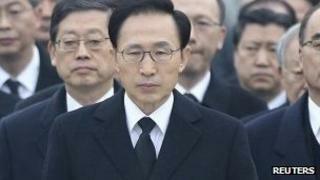 It has castigated the South for failing to send a formal delegation to pay respects to Kim Jong-il. And in its new year message, the regime told North Koreans to defend their new, young leader. "The whole party, the entire army and all the people should possess a firm conviction that they will become human bulwarks and human shields in defending Kim Jong-un unto death," the message carried by state news agency KCNA said. Kim Jong-un, meanwhile, spent New Year's Day visiting a tank division, state media said. His father was regularly reported to have visited factories, military units and agricultural projects on inspection tours around the country.